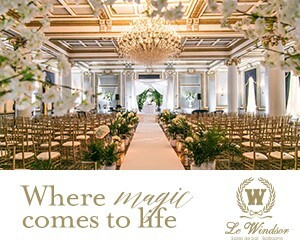 Although Lynn and Nan’s secret garden wedding was originally planned to take place outdoors, the luxurious celebration planned by Fusion Events and decorated by Decor & More Inc. at the Langdon Hall proved to be nothing short of amazing indoors. From the cake knife to the toasting glasses, receiving table and emblazoned dance floor, every element was personalized. Even the wax seal on the couple’s invitations was custom made. Thanks to bride Lynn’s mass collection of cake, flower and decor inspiration leading up to the big day, she was able to achieve the wedding she always dreamed of – even though it didn’t all go according to plan.